Cancun is an amazing place to vacation during the winter months. It has everything that you would want in a vacation destination: shopping, spas, sports, beaches and a great Mexican culture. Here is your NH Travel Agency guide to vacationing in Cancun, Mexico. You don’t have to worry about the sun shining here. The sun shines for 253 days out of the year in Cancun. During their high season which is November to April, the weather is almost perfect. You can expect temperatures of 84 degrees during the day and 64 degrees at night. Perfect weather for day and sleeping at night. If you are planning to head to Cancun during the busy season in the winter, plan ahead. This one of the most popular spring break destinations for college kids. You get to dance the night away to the salsa, cumbia, reggae, mariachi, hip-hop and many other types of music and clubs here. The Mayan Ruins are close by and makes an incredible day trip. You can see sites like Tulum, Coba, and Chichen Itza during the day. These sites are remarkable and full of history. Go windsurfing, rent a wave rider, a jungle boat or a paddleboard or just sprawl out on the sands near cool waters and soak up the sun. The culture here is amazing, and you can spend hours browsing the Mexican craft shops and interact with the locals. Local food is fantastic and plentiful for tourists. Indulge in local cuisines like lime soup, poc chuc, margaritas and traditional cuisine that most local eat. Cancun is one of the safest cities in the world. It is also one of the safest cities in all Mexico for tourists. During the peak of tourist season, the Tourist Police is increased to protect people during the busy season. If you find yourself in an emergency, there is an emergency 911 call center available. Of course, tourists are encouraged to use caution and common sense when you are traveling abroad. There are some general tours that you can take advantage of when in Cancun. 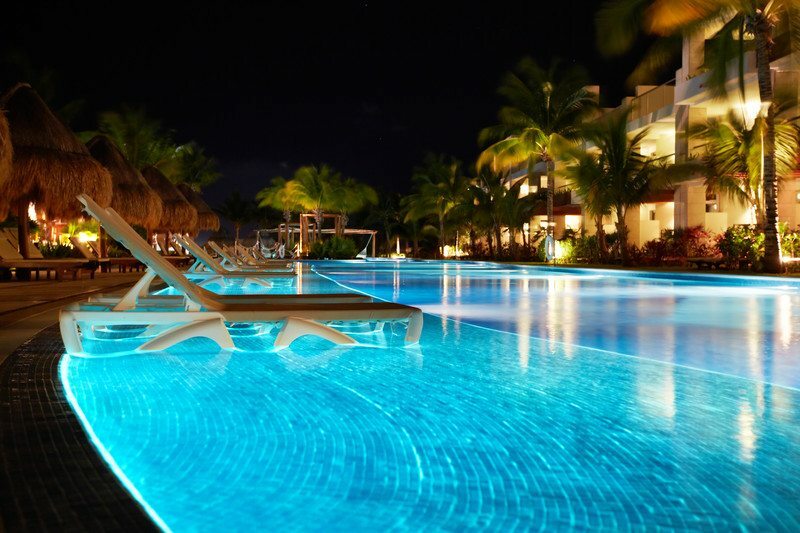 If you are interested in booking a vacation destination package to Cancun, contact Sarah at our office to get started. There are many advantages in using a travel agent to create a package that you actually want.